When a couple stands at the altar to exchange wedding vows, both promise many things to each other. Some share traditional vows and others write in their own words from the heart. Their focus is on the future and all it might hold for them. Yesterday was our 34th anniversary, and we were surrounded with friends and family, but it wasn’t as you would think. You see, a lifelong friend turned 60, and we hosted the celebration in our home. All of our children (except our favorite son-in-love) were here and so were our 5 grandchildren. The day was filled with sharing memories, poems, cards, gifts and lots of coffee and laughter. It was a perfect day, much like our wedding day. Life is like that. It brings opportunities to embrace the moment capturing in our hearts memories that last a lifetime. Tonight Tom and I will celebrate our anniversary in the traditional way–we’ll go out for a quiet dinner together, we’ll exchange cards and share our hearts with one another. But instead of only focusing on the unknown future, we can now look back a marvel at what God has done. Doing so gives us faith for the “not yet” of our lives. How is God helping you have faith for the “not yet”? Can you look back and see how His hand was at work when you didn’t see it in the moment? How can this help you today as you face an unknown future? Taking part in the Challenge? Click on the GYRO Challenge button in the header and share with us what you did under Week #2. This entry was posted in Aging, Celebrations, Christian Marriage, Growing Strong Marriages, Newlyweds, Seasons of Life, Testimonies, The Gospel & Marriage and tagged Ceremony, God, marriage, Marriage vows, relationship, The Perfect Day, Wedding, Weddings. Bookmark the permalink. Congratulations to you both! I’m sure it was an awesome time of sharing love and memories. And I certainly pray that you are given many more to enjoy together! I can look back now and see how God has worked many things together for my/our good – things that were the cause of much pain back then have shaped us into what we have become today. And it’s definitely a much better place to be. Thanks for continuing to share your life journey with the world. It’s always good to see how God moves in others’ lives! Thanks, Jason. You are such an encourager! Congratulations on your survival of 34 years…May you have 34 more- at least! Love this and LOVE the picture! Thanks for sharing! You two are such an amazing, special couple and we love ya! Thank you Kate. 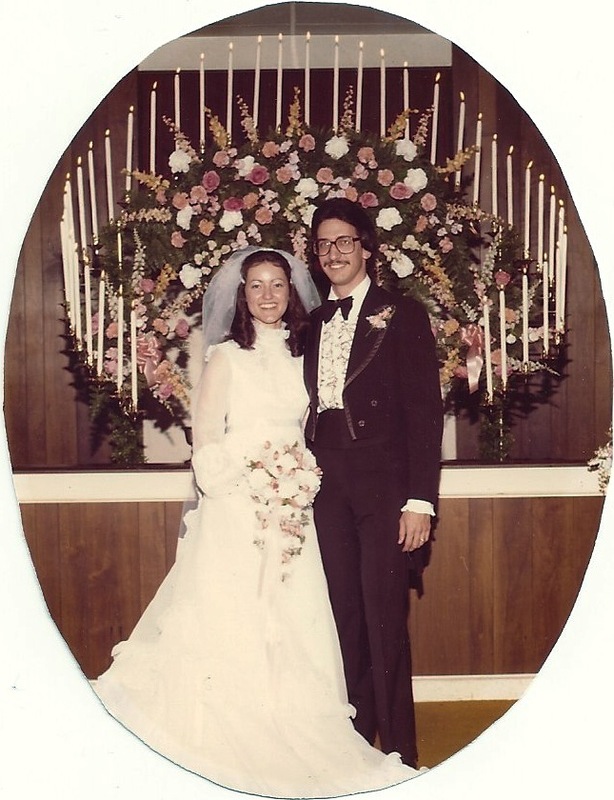 We realize how old we are when we look at our wedding pictures–we were so young! It seems a lifetime ago. We love you both too! Congratulations to you both! We too will celebrate our 34th anniversary this July and looking at your pic and remembering our wedding and how the candles and flowers were done back then is fun. It would take a book to hold all the “look back and see what the Lord has done” moments in our lives and marriage. Our motto for the next 34 years is “grow old with me, the best is yet to be” and we have great anticipation for the years ahead knowing God is there with us.